"Point Park has been so helpful in accelerating my career path. Professor Sandy Mervosh has done so much to help HR students and the entire program ... I can’t imagine how my life would be if I hadn’t chosen to come to Point Park." 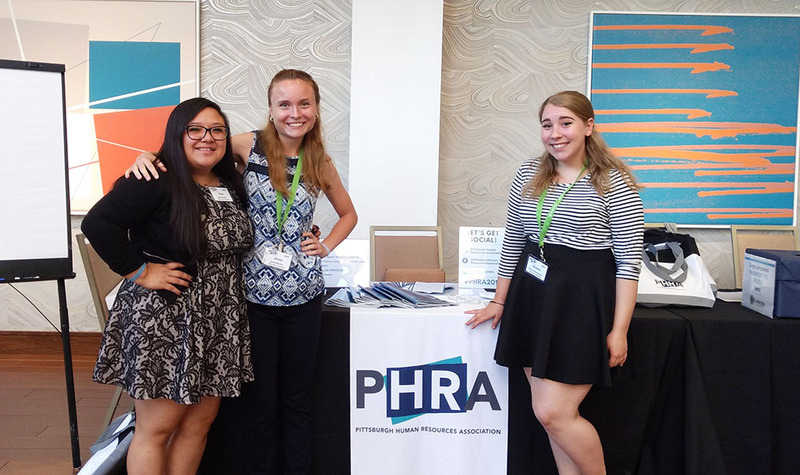 Point Park University human resource management students Kristen Blazeyewski ‘19, Olga Herrera ‘19, Jennifer Murtha ‘19 and Samantha Weber ‘21, were invited to the Pittsburgh Human Resource Association 70th Annual Conference in Mars, Pa.
As members of the Society for Human Resource Management, the world’s largest HR professional society, these Point Park HR management majors were among only a small group of college students who attended the conference. “The students got the unique chance to connect with many HR professionals through the Pittsburgh region. Networking opportunities like this are invaluable,” said Sandra Mervosh, M.S., SHRM-SCP, SPHR, assistant professor and coordinator of the HR management program at Point Park. A graduate of Keystone Oaks High School, Murtha attended the conference last year and was ready to return. “I learned more about how to recruit and hire individuals of different backgrounds to help your company thrive, how to deal with stress both at work and at home and why it is vital to expand your skill set and network at all levels in your HR career,” she said. Murtha, who will graduate from Point Park in the spring, has recently accepted a full-time HR position. “Several of my professors including Sandy Mervosh, Wayne Grim and Dan Mitchell have been so helpful and instrumental in my academic, personal and professional development in order to help me achieve landing this job before graduation,” she explained. For Blazeyewski and Weber, the networking they experienced at the conference was essential. “I learned a lot of interesting things throughout the conference, but the most beneficial part was the networking,” said Blazeyewski, a graduate of Brentwood High School. Weber’s goal is be a recruiter with the health care field. Her partner this year in the Point Park University Employer Partner Program is Phillip Sinopoli, associate ombudsman for TE Connectivity. "This program partners HR students with HR professionals in the student's area of career interest," Weber explained. Herrera, a graduate of Ligonier Valley High School, enjoyed the conference keynote speaker’s message about the importance of HR professionals maintaining resilience and perseverance in the field. “I want to work in HR, but I am not entirely sure what my career goal is yet. The awesome thing about Point Park is that the faculty are helping me decided what I want to do. Professor Sandy Mervosh is amazing and is doing everything she can to help me. Because of her, I got an internship in HR that I loved,” she said.